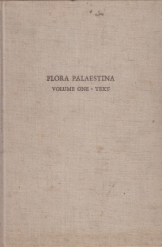 Flora Palaestina, Volumes One, Two and Three by Michael Zohary. Volume One, From Equisetaceae to Moringaceae: Preface; Acknowledgements; Literature; Abbreviations; Gossary; Key to the Families; Synopsis of Families in Part One; Text; Appendix Diagnoses Plantarum Novarum; Addenda and Errata; Index; Maps, 364 pages. Volume Two, Platanaceae to Umbelliferae: Synopsis of Families in Part Two; Text; Appendix: Diagnoses Plantarum Novarum; Addenda and Errata; Index; Maps, 490 pages. Volume Three, Ericaceae to Compositae: Abbreviations; Glossary; Synopsis of Families in Part Three; Text; Appendix: Diagnoses Plantarum Novarm; Addenda and Corrigenda; Index Maps, 481 pages.